Micro Crystal AG, a company of the Swatch Group Inc. Switzerland, was founded in 1978 in Grenchen, Switzerland, as a producer of Tuning Fork Crystals for watches. Today, Micro Crystal AG is a leading manufacturer of Miniature Tuning Fork Quartz Crystals (32kHz to 250MHz), Real Time Clocks, Oscillators and OCXOs for the world’s leading manufacturers of mobile phones, consumer products, computers, automobile electronics, watches, industrial controls, as well as medical implantable devices and other high-reliability product applications. 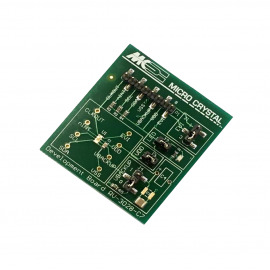 With offices located around the globe, Micro Crystal AG provides in-depth support for our customers from design-in to mass production. 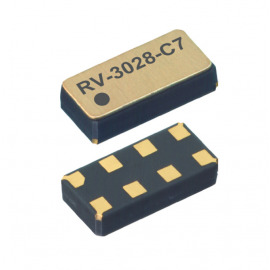 The RV-3028-C7 is a SMT Real-Time Clock Module that incorporates an integrated CMOS circuit together with an XTAL. It operates under vacuum in a hermetically sealed ceramic package with metal lid. The RV-3028-C7 is soldered onto the Development Board. Every pin is accessible at test pins 1–8 and at the test vias situated around the device.